The main reason for the holiday was a significant birthday for my husband and his desire to avoid anything that might surprise him on the day. He would have hated a big party and being fussed over so going abroad was the perfect way to make sure it would be a low key affair. I booked it all independently starting with flights via Jet2 which came in at an eye watering £1300 for 5 of us - even though we were taking the kids out of school early! It would have been £500 more if we'd waited until the school holidays started. 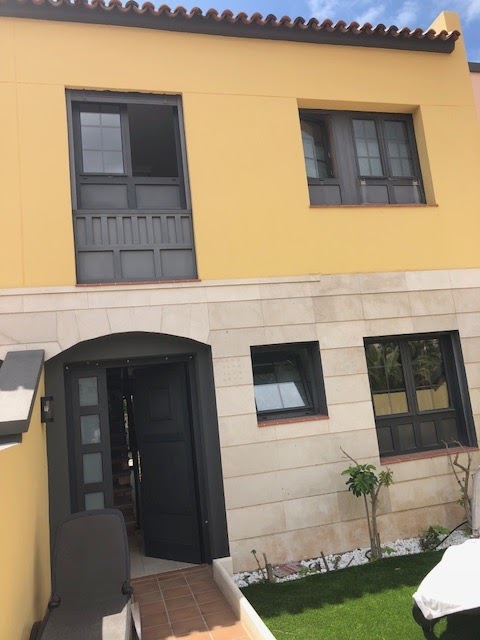 I used HomeAway to find a villa to stay in as it’s too difficult to get hotel accommodation that works when you have 3 kids. After much to-ing and fro-ing, we decided to pay a little more for a 3-bed central property given we would be saving ourselves the cost of a hire car. 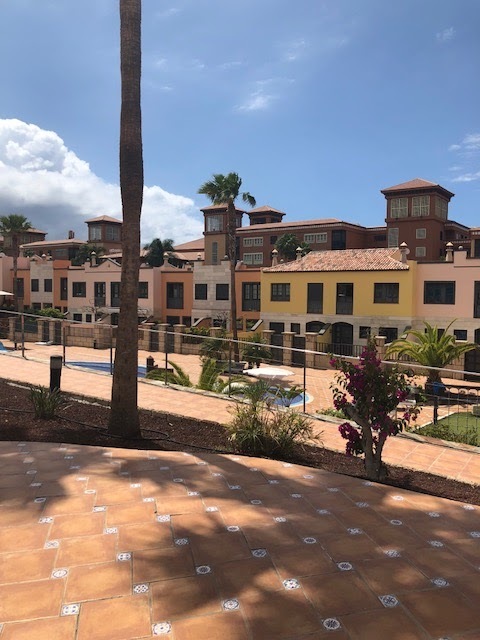 And this is the place we settled on, a town house in a 57-house complex on the edge of Costa Adeje. It ticked all the boxes - there wasn’t an interior inspo box luckily 🙈 though it wasn’t as bad as the photos in the link in real life...the pink & orange had been well toned down. The best bit about the house was the private pool area. We opened our gate from our garden straight onto the pool which had a lifeguard every day. The kids were in it within 10 minutes of arriving and as it was just before the main Easter rush, we had the pool to ourselves most days. There were a couple of negatives, the main one being the difficulty my husband and I had sleeping (kids slept like logs). The neighbours were an elderly insomniac couple who loved a good discussion and a spot of furniture rearranging at 3am most nights. But I suspect much of it was that tiled surface thing where you’ve no soft furnishings to absorb the sound and I eventually realised the air con set at low provided a good level of white noise. 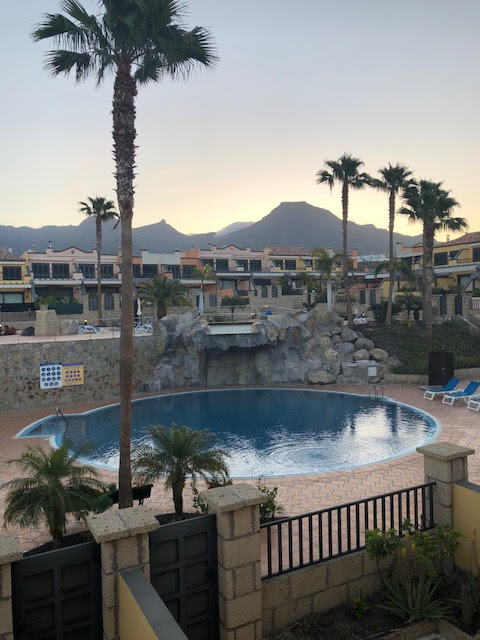 Location wise, we were right beside a few great restaurants (Jade Stone was a favourite) and an express supermarket and within minutes of the promenade that stretches for miles along the coast from La Caleta to Los Christianos. 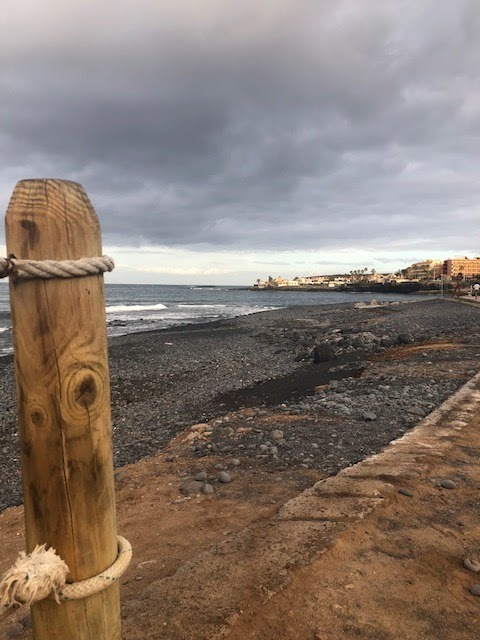 La Caleta was particularly beautiful and such an antidote to the commercialism of Playa and Los Christanos. There were some gorgeous fish restaurants over this side of Costa Adeje too. 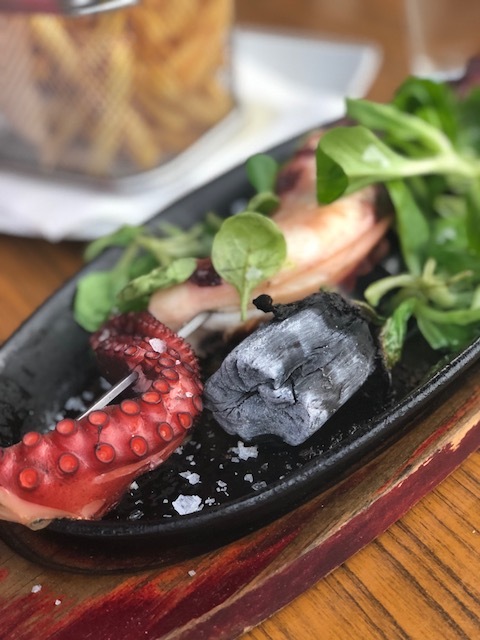 This was an octopus dish my son had on one of the evenings - arrived with a hot charcoal which caused much amusement at the table! It's a great location if you like to walk - we averaged 18k steps each day. But there was also a bus service from the top of our road, which was really useful and we used it several times. Took an age mind you as it stopped at every hole in the hedge. We didn't do anything other than beach and pool while we were there as the kids were having so much fun and didn't ask to do anything else. Friends who were there at the same time visited Siam Park and absolutely loved it, highly rating the cleanliness, the variety of rides and the reasonable prices for food and drink, so it's worth checking out. Would I recommend the holiday? 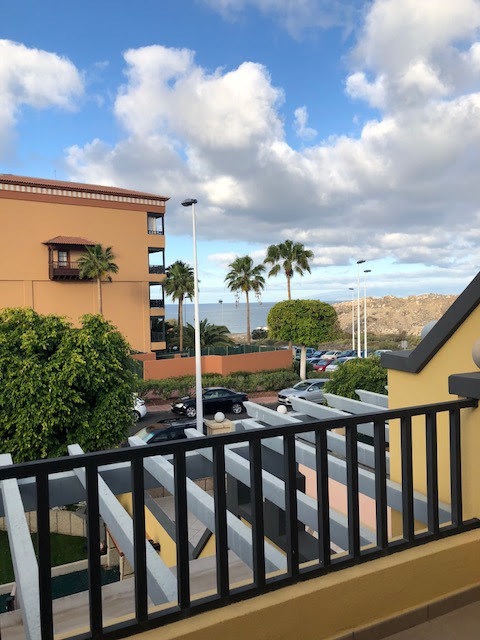 Tenerife is great for guaranteed good weather - apparently it's the most reliable of all the Canary Islands so if it was for winter sun, I'd say yes but I wouldn't want to go to such a busy resort again. 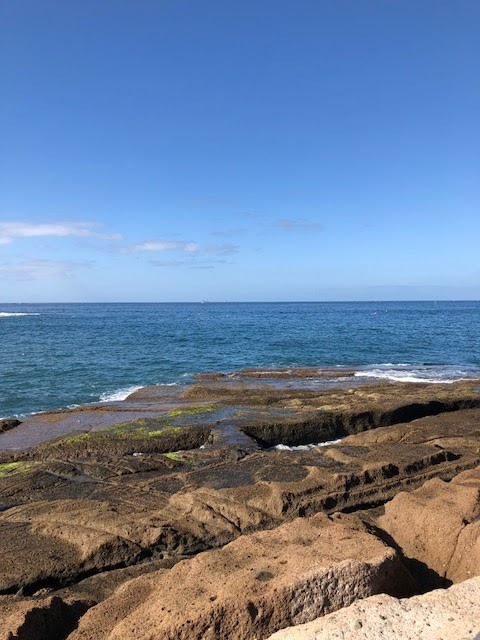 I think next time (hopefully not in another 10 years), we will revisit Lanzarote as we much preferred the quieter resorts there when we visited before. It's also a more picturesque island thanks to the stringent planning laws around high rise hotels. 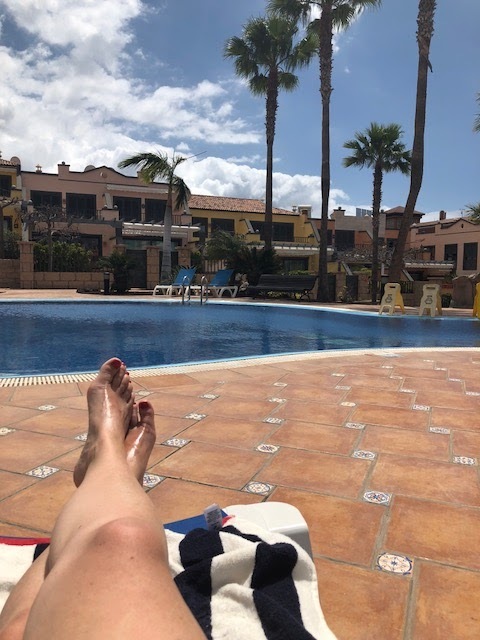 So there you go - not exactly a comprehensive review of the stay...but I decided to take a social media break for the whole 11 days which made it truly feel like a holiday I have to say. It's funny how automatically as a blogger we pick up phones and take pictures to share online. So much so, it took me a few days to get used to seeing a gorgeous view or a beautiful photo opp and not reach for the phone. Oh and before I finish, I have been asked so much about what I brought in my suitcase so I've got another post in the pipeline about what I wore and how badly I packed - yes really badly! Working on it this weekend also so I'll be back as soon as.